I'm trying to provision two lists (List 1 and List 2). 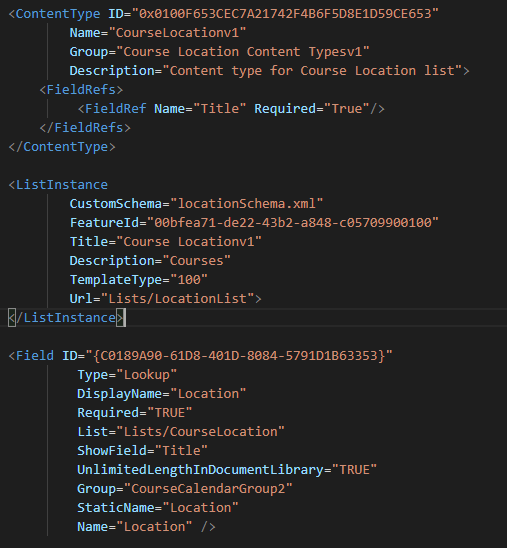 List 1 has a Title column and in List 2 i want to create a Lookup field with a reference to the Title column in List 1. The problem is that when a try to install the application it gives an error. When i try to provision the lists without the Lookup field the install is flawless, so the error is definitely linked to the Lookup field. Heres some of the code from the elements.xml. I really hope that somebody has an answer to my problem. Thanks in advance. The problem is that the source list must already exist before the lookup can be created. In the old feature framework days I used to solve this by having the lookup and its list in a separate feature that was activated after the source list. I'm not sure if spfx provisioning allows multiple features like that in one solution, so if you can't do that you might want to try using two solutions. Not the answer you're looking for? Browse other questions tagged lookup-column spfx provisioning or ask your own question. How to tell if a column is a valid lookup reference?